This product was formerly named EnGen Cas9 NLS, S. pyogenes. EnGen Spy Cas9 NLS, is an RNA-guided endonuclease that catalyzes site- specific cleavage of double stranded DNA. The location of the break is within the target sequence 3 bases from the NGG PAM (Protospacer Adjacent Motif) (1). The PAM sequence, NGG, must follow the targeted region on the opposite strand of the DNA with respect to the region complementary sgRNA sequence. EnGen Spy Cas9 NLS contains Simian virus 40 (SV40) T antigen nuclear localization sequence (NLS) on the N- and C- termini of the protein. Cas9 and sgRNA targeting a human gene were delivered to HEK293 cells by transfection. 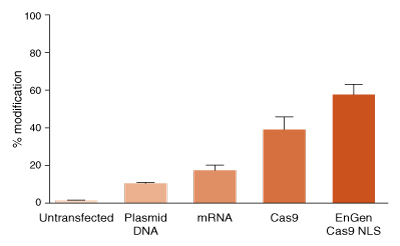 Transfected plasmid DNA contained expression cassettes for 2x NLS (N- and C-terminal) Cas9 and sgRNA. Plasmid DNA was delivered using TransIT-X2 (Mirus). Transfected mRNA was modified with pseudouridine and 5-methylcytosine and encoded 2x NLS (N-and C-terminal) Cas9. sgRNA was co-transfected with the mRNA using TransIT-mRNA. Cas9 RNPs were delivered in reverse transfections using Lipofectamine RNAiMAX (Life Technologies) using 10 nanomolar final concentration of ribonucleoprotein (RNP). Cas9 has no NLS in the protein sequence. EnGen Cas9 has N- and C-terminal NLSs. The efficiency of editing was determined using T7 Endonuclease I assay and is expressed as % modification. An E. coli strain that carries the cloned Cas9 gene from Streptococcus pyogenes with N- and C-terminal Simian virus 40 (SV40) nuclear localization signals (NLS) and a N- terminal 6XHis tag. Where is the nuclear localization signal on EnGen® Spy Cas9 NLS located? Which nuclear localization signal is fused to EnGen® Spy Cas9 NLS? What is the difference between EnGen® Spy Cas9 NLS (NEB #M0646) and Cas9 NLS, S.pyogenes (NEB #M0641)? Why does digestion efficiency differ between two different guide RNAs?